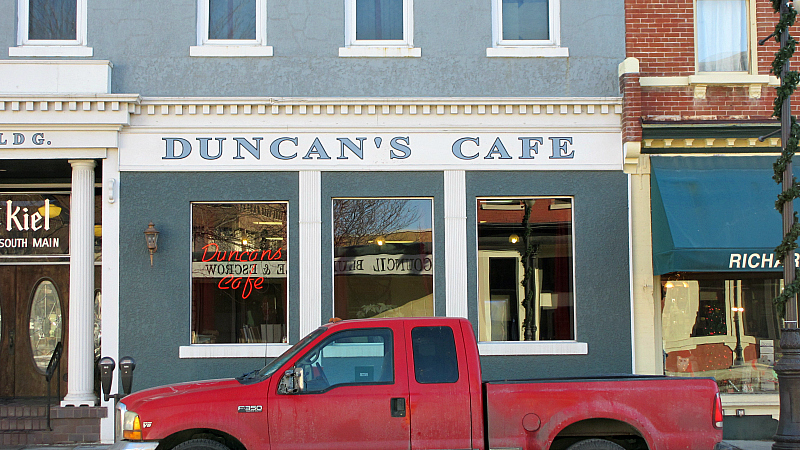 Duncan's cafe has been serving up breakfast and diner food in downtown Council Bluffs for a long time. I get the idea that Duncan's sells a lot of tenderloins, some other people were eating them as I walked through the dining area. Location: 501 S. Main St. in Council Bluffs, Pottawattamie County in Western Iowa. Directions: The cafe is at the corner of 5th and Main St. in the old downtown area. 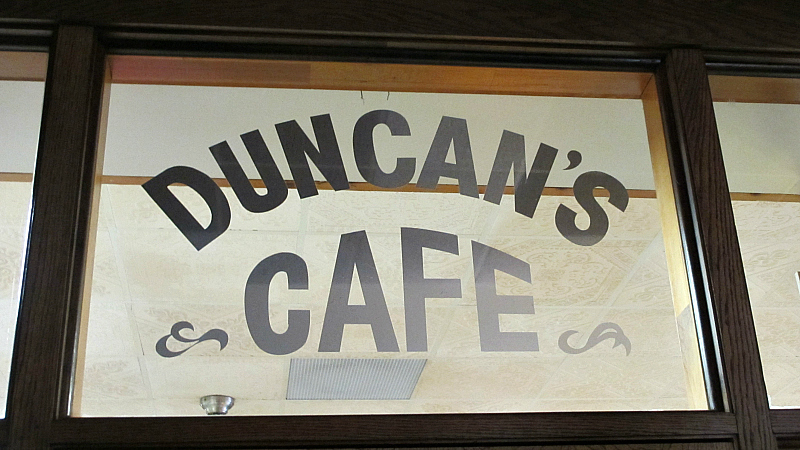 You have to enter a hallway area to reach Duncan's. 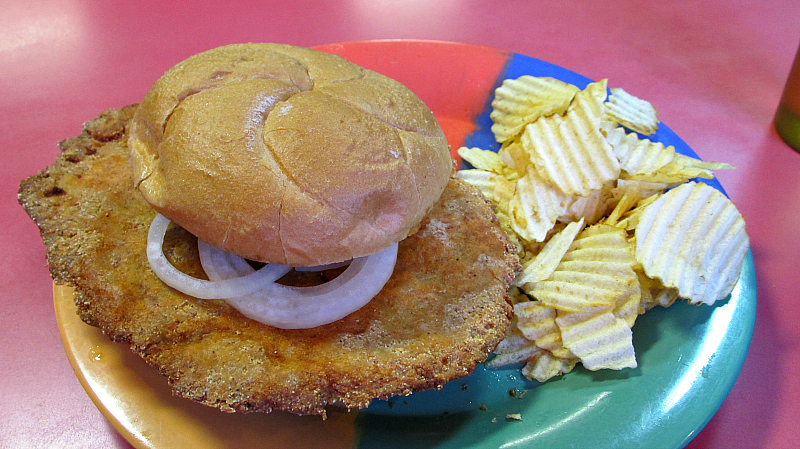 The Tenderloin: The size was good, this thing dominated the multicolored plate with potato chips. The meat portion would be described as steamy but not moist and definitely not juicy. 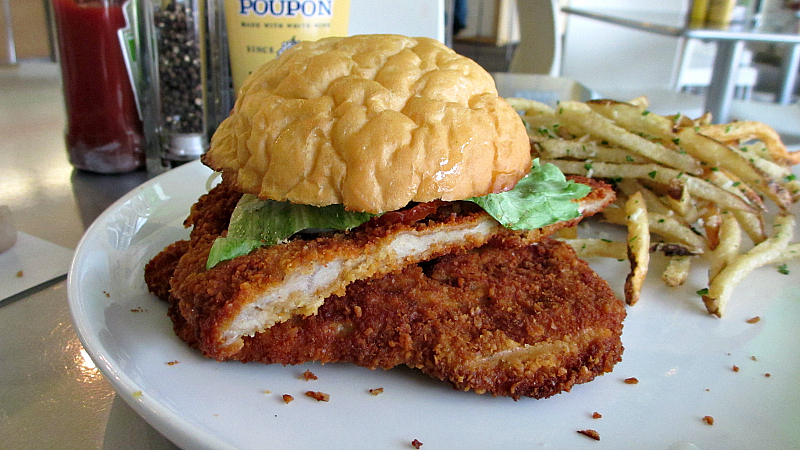 The breading felt dusty but had a distinct salty seasoning blend. Served on a large toasted bun that felt like the Rotella buns that come from Omaha. Those are good buns. Overall 7.1 out of ten. 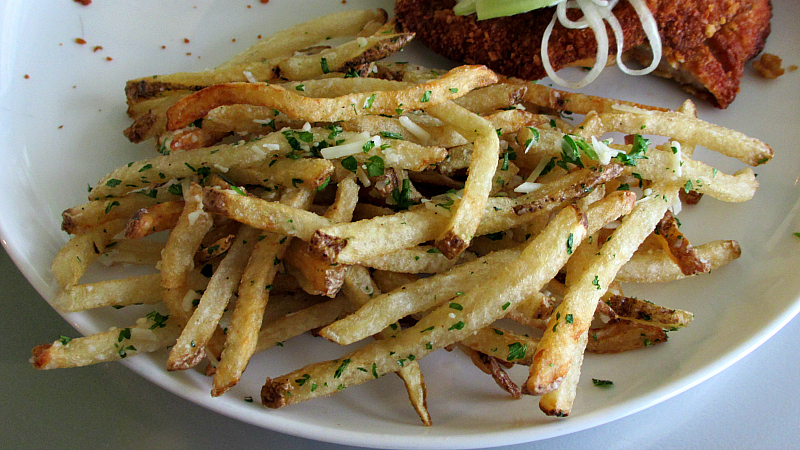 Price: 7.00 with fixins and a side of ruffled potato chips. Also on the menu: The menu is just regular diner food like chicken fried steak or daily specials, with full breakfast options served on big skillets. Service: Its just table service with a counter for paying the bill and grabbing to-go orders. 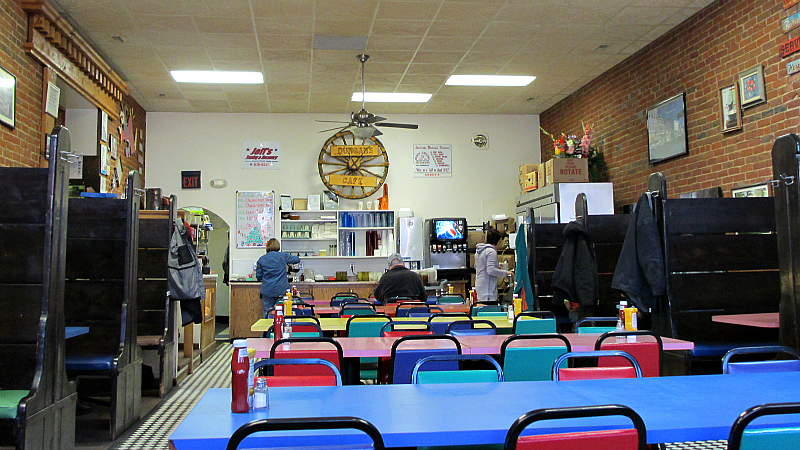 Ambiance: The outside of the building is a historic main street facade, but the interior is unsophisticated small town diner with tables and booths and bright colored plates. I almost expected the plates to start beeping and lighting up.The exposed brick walls are covered with just plain random and weird pictures. Final Thoughts: I have not exactly spent much time in Council Bluffs over the years. I read a local article a long time ago that pointed me towards the Railway Inn and LPL Lounge. I still haven't found a real good one any closer than the Dairy Sweet in Dunlap. My next stop might be a roadhouse in Beebeetown if I can find the time to drive through during the day. One of the biggest restaurant trends of the last decade was the proliferation of high end and upscale burger places across the country. 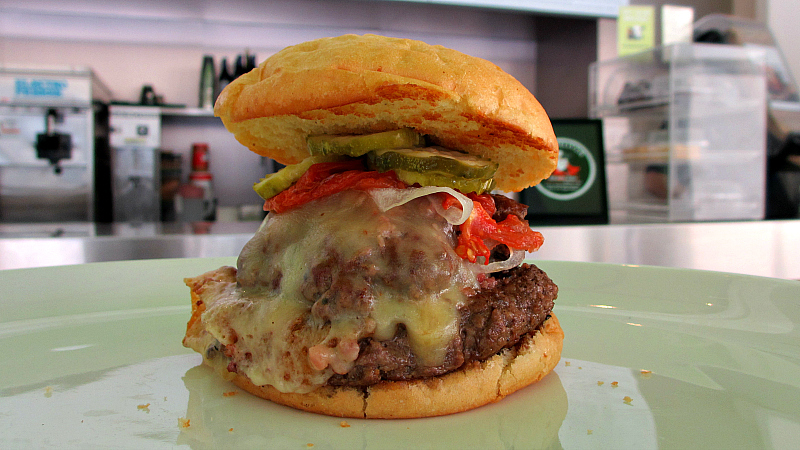 It used to be difficult just to find a burger topped with bleu cheese in Iowa, now its on practically every menu. If anything, its difficult to find a good "regular" burger that isn't topped with something exotic or given a goofy name or served in a themed restaurant. 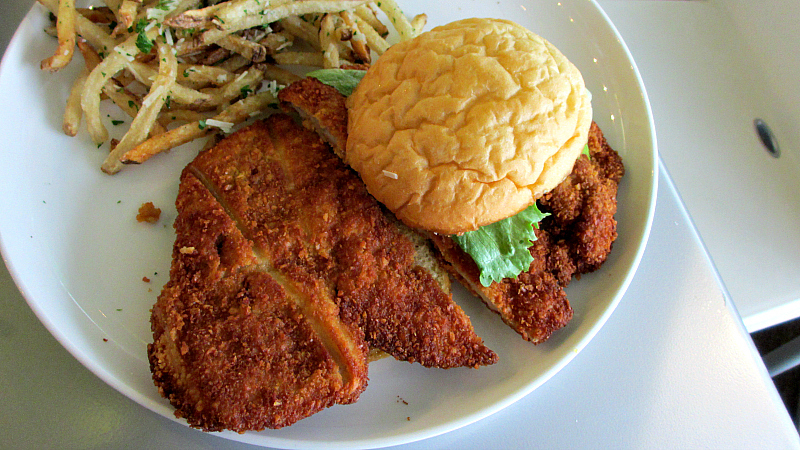 I knew BCBG had the breaded pork tenderloin sandwich as a daily special from time to time since they opened. I just happened to notice it on the regular menu on a recent trip to downtown Des Moines. Location: inside the Capital Square building at 400 Locust St in Downtown Des Moines. Directions: This is in the southwest corner of the ground floor of the Capital Square Building, accessible from the skywalk. 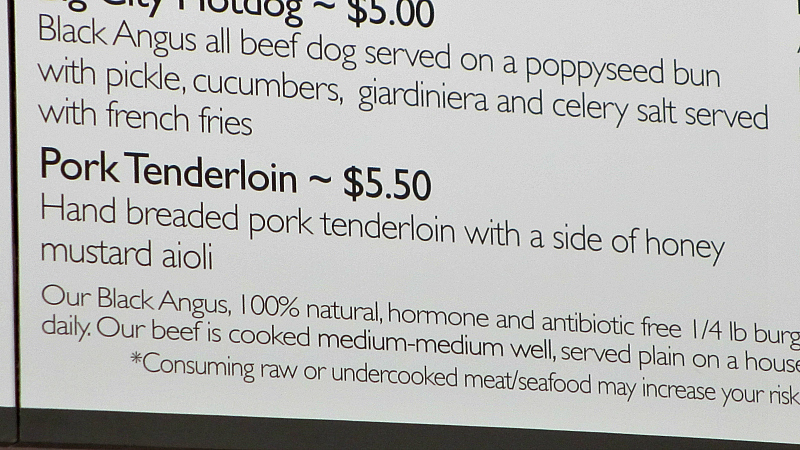 The Tenderloin: First things first, the size of the pork loin meat for the amount they are asking for is a great value. 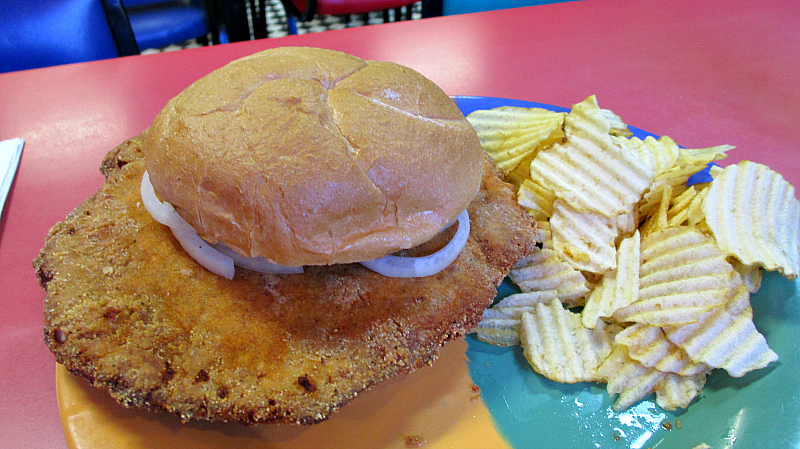 Its hard to find a decent homemade tenderloin downtown for any price. 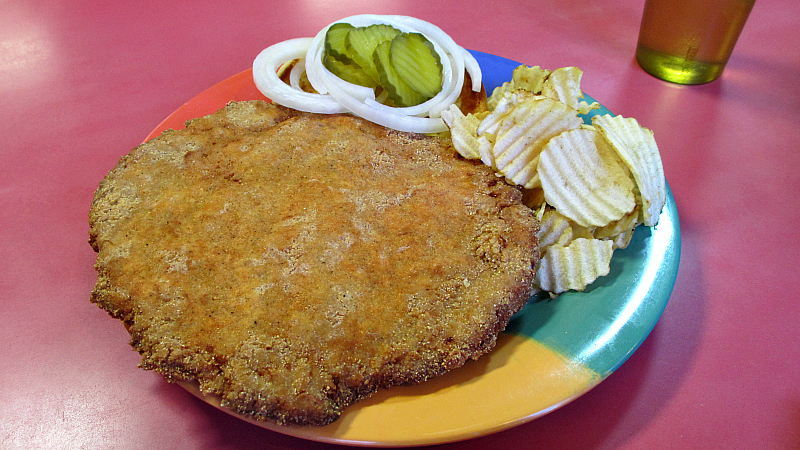 The loin meat is well tenderized and the coating of cracker textured breading has a great crunch. The menu's claim of "fresh ingredients" is not just promotional fluff. 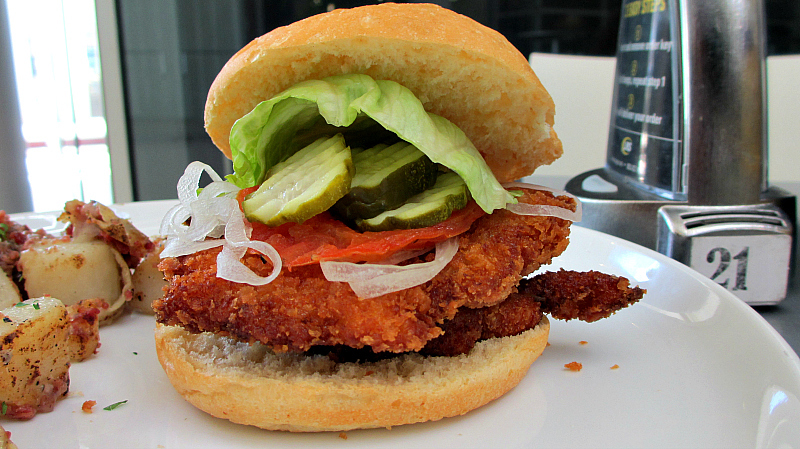 The lettuce and tomato are noticeable crisper and fresher than any other place serving tenderloins. The pickles were thick and juicy if that's your thing. But that brings me to another part of this sandwich. Its served "chopped", cut in halt. Why would someone take something that is beautiful and cut it in half? Even with a side of potatoes the presentation of the cut sandwich left so much empty space on the plate. Another problem was the "addition" of the side of honey mustard aioli sauce, this just seemed like a portion of salad dressing. I was under the impression that a confident chef would always serve his food the way he wanted people to eat it. Putting sauce on the side looks indecisive and pointless. At least the "honey mustard aioli" is served in a biodegradable container so after its thrown out it will vanish from the earth with less of a footprint. There are already two different mustard bottles at each table, why add this extra condiment when it isn't any better than the classic mustard described simply as "yellow". Served on a soft and warm toasted potato bun. Overall 7.7 out of ten. Price: $5.50 a la carte. Also on the menu: Burgers and Greens name refers to a menu which is mostly burgers and salads. They have unique daily specials and a huge selection of toppings for whatever you order. 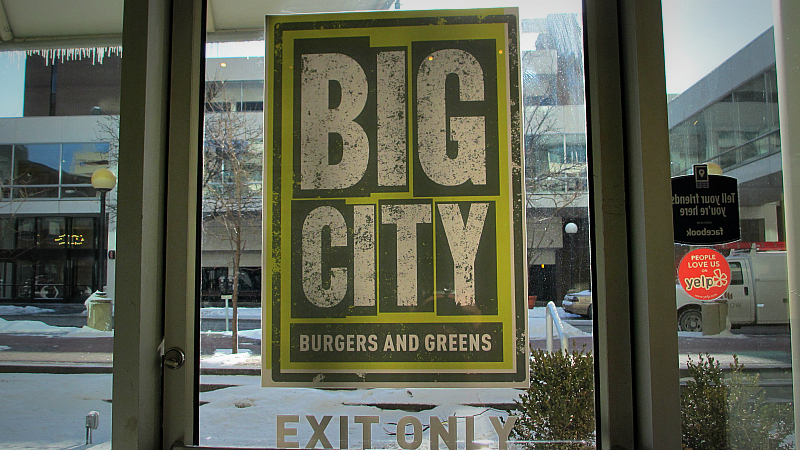 The Big City Burger: I ordered mine in the double size with white cheddar cheese and fried prosciutto. The prosciutto was under the fixins and was crumbled into tiny pieces. The melt job on the cheese was just right. The ground beef was in some thick round patties and cooked a little past medium well. 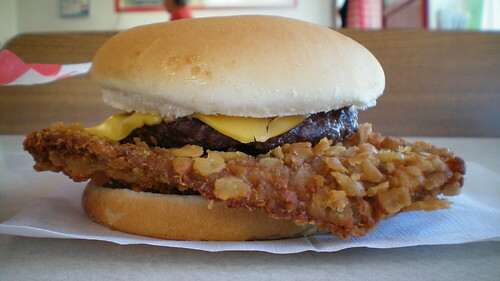 This is a tasty burger. Another side option is the Cheesy Potatoes, with little pieces of fried proscuitto mixed in with seasonings and Swiss cheese. 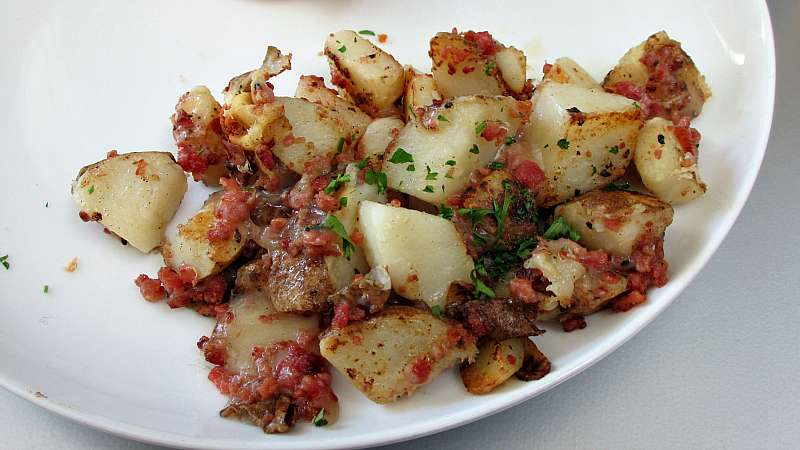 I like the thick chunky potatoes and the cheese was melted with garlic. This could have been something beautiful. Service: There is a long counter with an area where you can see the salads being made. They have some high tech system where you take a card and stick it into a machine that tells them where you are sitting and they bring the food to your table. 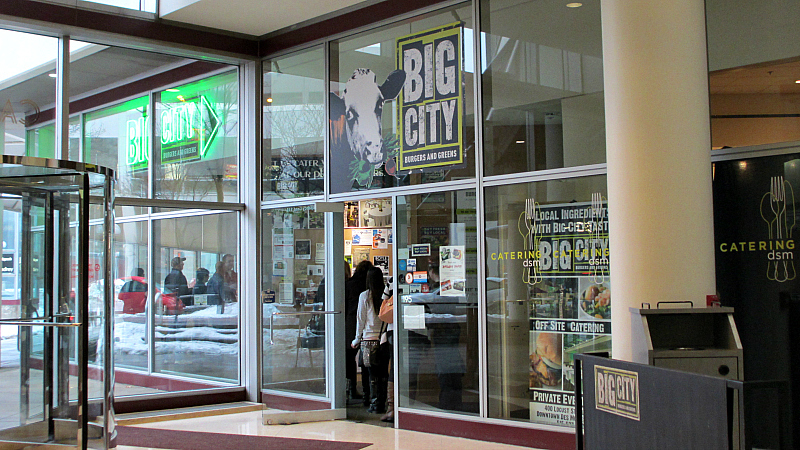 Like most lunch places attached to the skywalk, BCBG has short hours and is only open for lunch on weekdays. Ambiance: You have a great modern design with a green and white color scheme and three seating areas, inside and outside. They have another dining area for private parties or catered events. This is the nicest place in the thoroughly drab, terrible designed, utterly awful example of bad architecture known as the Capital Square building. Final Thoughts: BCBG is operated by some of the most professional restaurant people in Des Moines, and it shows. 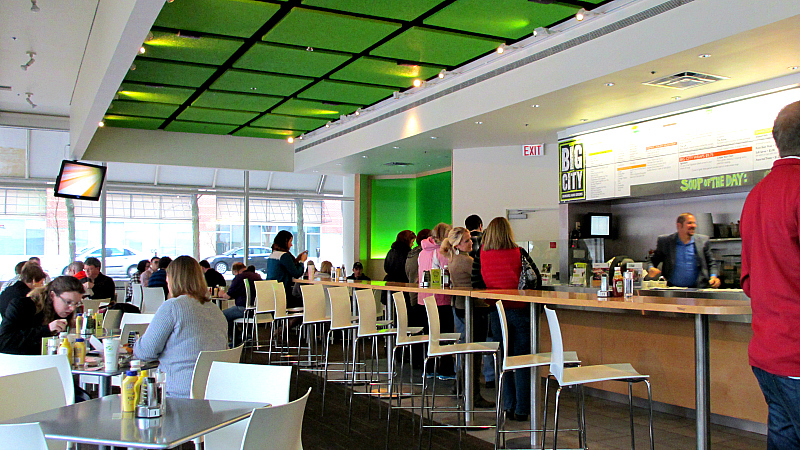 Lines move fast, food gets out quickly, the design is modern and bright. The toppings for the burgers are clearly fresher and higher quality than nearly any other place I have visited. Long before BCBG occupied this location, there was lunchtime pizza place that also served a tenderloin. I can't remember the name but I never made it in there before it closed. The location above BCBG was home to Stella's Blue Sky Diner, which did great business for a long time before moving to Urbandale and then closing a few years ago.